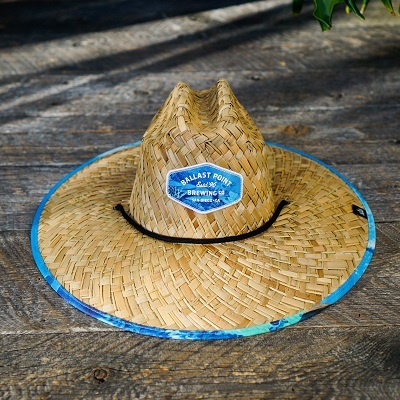 Just in time for the Spring weather in San Diego, check out this Fathom IPA inspired straw hat made by Hemlock. Made from 100% Straw with a 100% Polyester fabric under cover that not only sports our own Paul Elder’s iconic Fathom IPA diver art, but it is also UPF 50+ rated. From Anonymous of Ogden, Utah on 7/4/2018 . Arrived faster than expected, perfect condition. Good coverage from the brutal rays of the summer sun. All that is needed to enjoy is your favorite Ballast Point Ale. A well made hat, Cheers! From Anonymous of Carlsbad, California on 6/10/2018 . The perfect hat for sitting by the pool, going to the beach, gardening...basically anything out doors. Thank you Patrick from the San Diego Mira Mar location for recommending it to me! From Adam of Van Nuys, California on 5/5/2018 . I'm already sitting poolside, beer in hand with this beauty on my head. I know this will be my go-to hat from now on!